Production Manager required for touring production of ‘Nosferatu’ with critically acclaimed Northern Theatre Company. Touring from February 2014 to April 2014. Directed by James Beale. 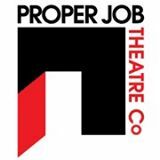 Produced by Proper Job Theatre Company. This play will be directed and produced by Proper Job Theatre Company with rehearsals and a period of Research and Development taking place at The Met, Bury, Greater Manchester. It will then be touring across Northern venues throughout March 2014. If successful at this stage you will be invited for a short interview. Please email Linda with a CV and short cover letter on mail@properjob.org.uk or if you have any questions call on 01484 514687. Fee: £1800 for the project = to approx 12 days of work (inclusive of all expenses). Exact days and times to be negotiated between successful applicant and company. It is recommended that any applicants have a Northern base to stay in during the research and development and rehearsal period. We will cover reasonable expenses during the tour. You will also need to be available during all the dates listed above (but not necessarily needed – see above in fee section), including the period of Research and Development.